In 2016, we saw the populist vote on the right help to elect a Republican president. Two years later, the populist vote, this time on the left, shifted the house from Republican to Democratic control. These two elections created the heated mix that led to the partial government shutdown and to even greater dysfunction in Washington on many other issues. Eventually, the populists influenced trade war and partial U.S. Government closing could put a damper on the U.S. Economic momentum carried over from 2018. 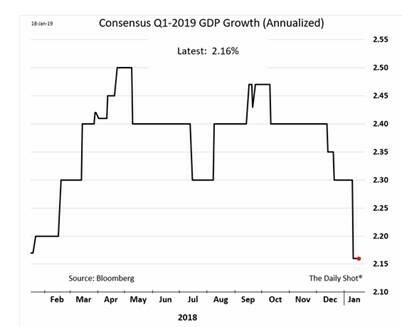 More specifically, Bloomberg consensus estimates for 2019’s first quarter growth recently declined sharply to 2.16% (see figure 1.) This would represent a significant drop from the 2.6% GDP growth forecasted for the last quarter of 2018. 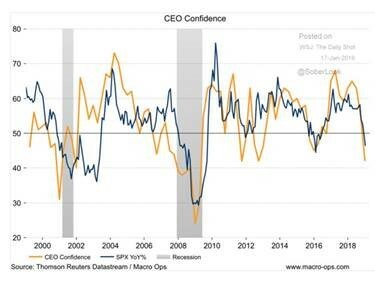 Political confidence importantly underlies the usual factors that drive both the economy and financial markets. Lacking political confidence, markets can falter and the economy suffer. The current populist driven split within this country reduces the political will to resolve differences on domestic issues as well as the trade war with China. That absence of political will undermines investor and business confidence in the leadership in Washington. 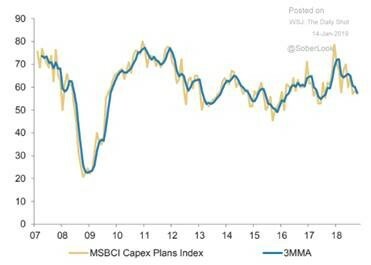 Nonetheless, we remain cautiously optimistic that at least one domestic issue as well as the trade war can be resolved early in the year. However, there remains some possibility that their resolution could turn out unfavorably from the perspective of both investors and business leaders. This could prove particularly troublesome if the dysfunction in Washington ultimately leads to a greater than projected economic slowdown. 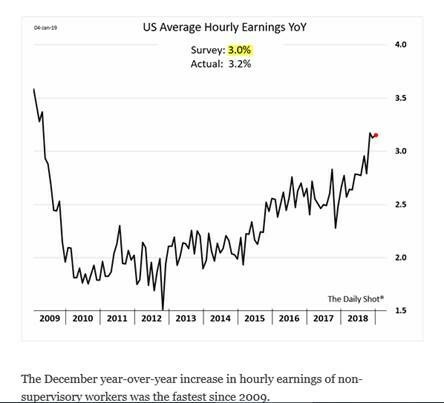 Both employment—a lagging or coincident indicator–and wages remain strong (see figures 2 and 3.) Adding to first quarter income will be increased tax refunds generated by last year’s over withholding as a result of the new tax law. The G.A.O. estimates nearly three-quarters of taxpayers over withheld during 2018. Besides incomes, their comfortable financial positions—particularly compared to corporations–should also encourage consumer spending (see figure 4.) 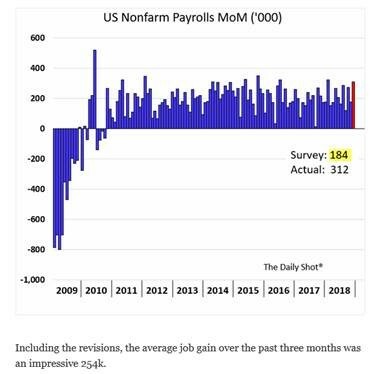 However, the question now arises whether the increasing disputes in Washington will ultimately pull-down consumer optimism and thereby short circuit their important spending contribution to economic momentum. 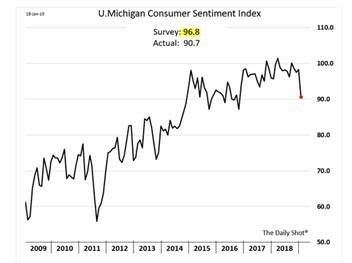 The first cloud over consumer optimism showed up with the decline in the recent University of Michigan consumer sentiment index (see figure 5.) The index dropped to its lowest level since Mr. Trump’s election. This downward shift likely reflects, among other factors, trade war headlines and December’s stock market decline. As a result, despite their comfortable financial situation, less buoyant consumers may save more as opposed to opening their wallet and spending. In addition, increased stock market volatility and its potential negative wealth effect may test upper income spending. If this proves the case, sales of travel, entertainment, and restaurant services along with luxury goods might suffer. Settlements of the partial government shutdown and eventually the trade war should bring positive short-term financial market reactions. Longer term, increasing investment uncertainty will likely reflect the maturing economic cycle and a possible slowing economy later this year. Recognizing these longer-term uncertainties, our investment strategy calls for an equal asset mix of equities, alternatives, and short duration fixed income securities. Among equities, stocks of corporations that can maintain consistent earnings growth at attractive valuations should benefit from the possible shortage of economic growth. We debated within ourselves whether to lengthen, modestly, the fixed income asset duration. This consideration reflects the growing likelihood the Federal Open Market Committee (FOMC) ends its rate hikes in 2019 with the possible economic slowing later this year. Our internal debate will continue, and we suspect modestly lengthening duration will eventually win out. First Capital Advisors Group, LLC is a federally registered investment adviser under the Investment Advisers Act of 1940. Registration as an investment adviser does not imply a certain level of skill or training. The oral and written communications of an adviser provide you with information about which you determine to hire or retain an adviser. First Capital Advisors Group, LLC, form Adv part 2a & 2b can be obtained by written request directly to: First Capital Advisors Group, LLC 512 east township road, 5 valley plaza, bluebell, pa 19422. This is prepared for informational purposes only. It does not address specific investment objectives nor is the content intended as an offer or solicitation for the purchase or sale of any security. Although taken from reliable sources, First Capital Advisors cannot guarantee the accuracy of the information received from third parties. The S&P 500 Index is a market-capitalization-weighted index of the 500 largest U.S. publicly traded companies by market value, The index is widely regarded as the best single gauge of large-cap U.S. equities. ATA Truck Tonnage Index- The truck tonnage index is an index that measures the gross tonnage of freight which is transported by motor carriers in the United States for a given month. The index serves as an indicator of shipping activity and consumption of goods in the U.S. Analysts also use the truck tonnage index to determine the state of the U.S. economy as over 70-percent of all freight tonnage is via truck. The Rebound – Now What? What’ll Bust Stocks Out of Their Current Range? First Capital Advisors Group aims to be the finest wealth management firm in the U.S. Our combination of wealth management expertise and advisory support gives us the institutional investment quality of a large national brand, with the boutique approach of a private wealth management firm. We employ a disciplined process to craft solutions designed to meet the needs of our clients.